Directly in the center of the Redwood National and State Parks, visitors have been welcomed to this part of the world for over 50 years. The trail is open and maintained year-round. There is a shuttle to Sky Trail for those who cannot easily walk the trail. 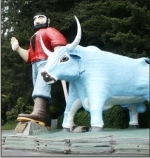 In the summer months, the 49 foot 2 inch tall Paul Bunyan and his 35 foot tall friend, Babe the Blue Ox, waves and welcomes you to the Trees of Mystery. The free admission End of the Trail Native American museum is a privately owned collection.